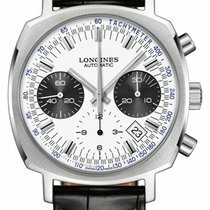 Longines Heritage Column-Wheel Chronograph L27424022 men's watch. Features a polished stainless steel case and brown leather strap with crocodile pattern. Polished stainless steel fixed bezel. Silver dial with black sub-dials. Luminescent rose gold hands. Luminescent rose gold index hour markers and Arabic numeral 12 o'clock hour marker. Date displayed in window between 4 and 5 o'clock. 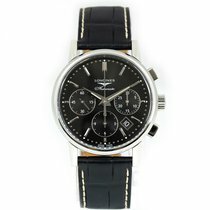 Chronograph with large central chronograph seconds hand, 30 minute counter sub-dial at 3 o'clock and 12 hour counter sub-dial at 6 o'clock. Small seconds sub-dial at 9 o'clock. 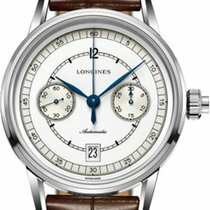 Powered by the Longines calibre L688 self-winding automatic movement which boasts a 54 hour power reserve, beats at 28,800 vph and contains 27 jewels. A scratch resistant sapphire crystal protects the dial. The case is round, 39mm in diameter and 14.3mm thick. Sapphire crystal exhibition case back. Push and pull crown. Stainless steel tang buckle. Water resistant to 30 meters / 100 feet. Functions: hours, minutes, small seconds, date, chronograph. Casual watch style. Swiss made.